Streamlined Environmental presented expert evidence at an Environment Court hearing on behalf of the Todd Property Group. The matter before the Court was an application by Okura Holdings Ltd to extend the rural-urban boundary at Okura, north of Auckland CBD, to provide for a form of urban development that embraces the principles of Water Sensitive Design. Dr Malcolm Green led a team that included scientists from NIWA that assessed the risk of ecologically-damaging sedimentation occurring in Okura estuary, which is a marine reserve, during the earthworking phase of the proposed developed. An estuary sediment transport model coupled to a catchment erosion model was used to predict the spatial pattern of deposition in the coastal marine area under a range of rainfalls, tides and winds of sediment eroded from the proposed earthworks. The results were used by NIWA marine ecologists to predict the associated impacts on the estuarine ecosystem. Mal also developed a model for predicting the long-term accumulation of heavy metals in the estuary under the mature urban development. 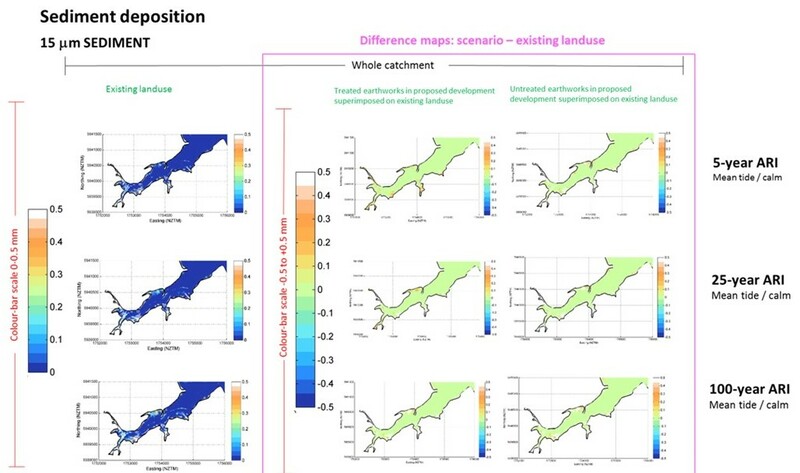 Using data from a field survey, Dr Ngaire Phillips of Streamlined Environmental applied the Stream Ecological Valuation (SEV) method to predict the state and functioning of permanent and intermittent streams under a favoured and an alternative development scenario. Dr Green and Dr Phillips presented their results in expert evidence to the Environment Court in Auckland in late 2017.